The project was centered in a food production facility. Although the plant was on holiday shut-down, it was still vital that we created adequate containment, so dust wouldn’t contaminate the clean-sensitive area. We encapsulated the area with containment housing that provided walls and ceiling. Once the containment was erected, we jack hammered the original floor, and then used a planetary grinder to level out the floor. Total, 98 hours was to erect the containment and adequately prepare the floor for install. The first coat was a 1/16th urethane cement primer. The primer was used to help seal the open concrete. Open concrete releases vapor transmissions. The goal with the 1/16th” urethane cement primer is to reseal the floor, to prevent any outgassing from creating “pin-holes” in the urethane cement. 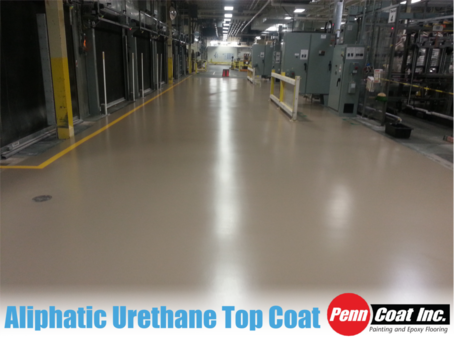 After allowing a full day to cure, a 3/16th urethane cement intermediate coat was applied. It was imperative to schedule the 2nd application within 24 hours to secure a chemical bond between the 1st and 2nd coats. Total, 50 hours was estimated to install the 1st and 2nd coat of urethane cement. To maximize adhesion between the urethane cement and epoxy, we grinded over the urethane cement. Epoxy doesn’t conceal blemishes very well. So we grinded the floor with high-grit bond heads, to leave as little profile as possible. Then, we installed a 20mil coat of epoxy, so there was enough material to hide as much blemishes as possible. The installers allowed a 24 hour cure time. As with the urethane cement, it was important that the final top coat be installed within a 24 hour window, to secure a chemical bond between the epoxy and aliphatic urethane topcoat. Between the epoxy coat and the aliphatic urethane top coat, 40 hours was estimated to install the last 2 coats. Overall, the final product was a solid floor that offered slip resistance at a coefficient friction of 0.7, that was installed on top of a floor strong enough to withstand high traffic volume. The final project was completed in 43 hours under budget. Nicely done project; thanks for posting it. Did you put any anti-slip additive in the top coat, or is it effective without? No additive was required. The product we used does have an optional additive, which would have increased the coefficient friction to 0.8. Are these rates good for a new build development?? Looking to get a cordless framing gun.